Brought Warren and his team in to paint our rental unit. They arrived on-time, did their regular excellent job, left the place clean and the job looked excellent. I will continue to recommend Warren and his crew as they continue to produce great results. Warren and Paul did a terrific job from start to to finish. They were reasonably priced, efficient and pleasant. I didn’t have to wait any time from quote to job done! Warren was the third quote we got for our basement (with wainscoting!) and his was the most realistic yet affordable. He advised us on materials and worked around our schedule. Despite the horrendous weather, he and Paul showed up and completed the job in a very timely manner. We highly recommend WG Painting and we'll definitely be using them again for our next paint job! Moving back to Toronto last summer, Warren was able to give me a quick quote and work around our possession date/moving truck dates to give our “new old” house a freshen up. We’ve just had him and Paul back to touch up some areas after we made a few changes to the space and needed the baseboards done after floor refinishing. Again, they were able to fit us in fairly quickly and we love the results. Thank you! WG was recommended recommended to us by our friends, so we hired them to come and freshen up our basement. They did such a wonderful. My husband and I love our basement now! I had two bedrooms that were in desperate need of repair, I hired WG painting to repair the rooms and paint them. Adam and Paul came in for one day, and now I have two beautiful bedrooms. Thanks guys! I hired Warren and his crew to paint my home, and they did an excellent job. They were clean, courteous and professional. The job was fairly priced and completed on time. I would highly recommend WG painting to anyone looking to freshen up their home. They were fast and it was done so well. I love it! What A Great job! And I didn't have to do it so that is good! Communication was excellent! Hired Warren and his team to change the color of oyr main floor. Warren arrived within an hour to give us a quote. His team arrived o the given day on time they got everything done on time and left it cleaner than whe n they arrived. We are very plkeasd with the service and friendly demenor of the team. Highly recomended. 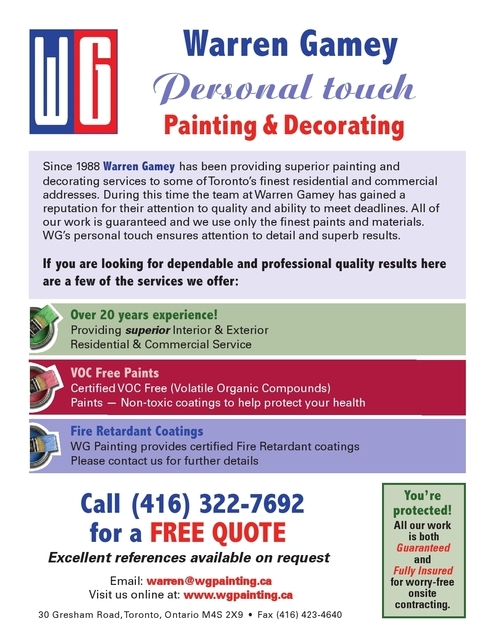 Since 1988 Warren Gamey has been providing superior painting and decorating services to some of Toronto’s finest residential and commercial addresses. During this time the team at Warren Gamey has gained a reputation for their attention to quality and ability to meet deadlines. All of our work is guaranteed and we use only the finest paints and materials. WG’s personal touch ensures attention to detail and superb results.